Double deal sizes and accelerate sales funnels in no time! Brand advocates bring in new leads, new customers, and extra profit. 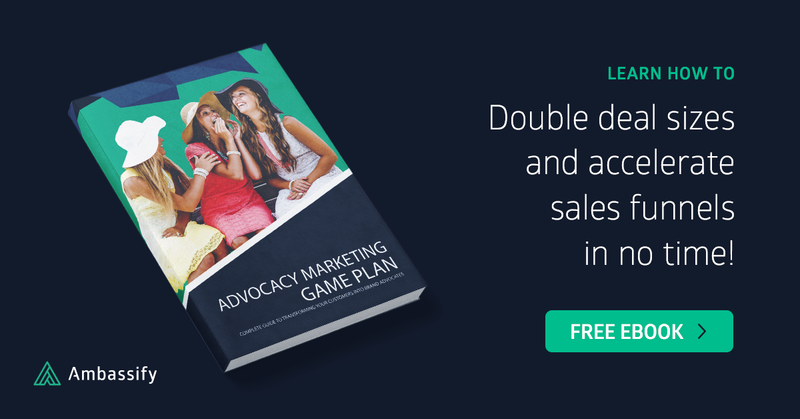 To make this work for you and actionable, just follow the hands-on steps in our free advocacy marketing guide! How Does An Advocate Marketing Program Exactly Work? Through a unique technology, we identify your genuine advocates. These are the ones that are pro-actively promoting your brand on social channels and offline events. Invite your advocates to share your new blogpost, or to review a new feature you released. With over 20 different campaign types your community will be engaged at all times. Going global? Don’t worry! You can communicate with your advocates in the language of their choice! Monitor and analyze the results of your advocacy program. Boost your brand advocates' engagement by showing your appreciation and reward your advocates with gifts, gadgets, exclusive deals and much more.